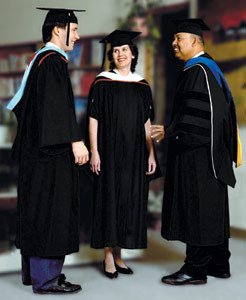 Bachelors, masters and doctoral level academic attire including graduation gowns and academic hoods. You've worked hard earning your degree. Obtaining quality academic regalia shouldn't be a struggle. Let Caps and Gowns Direct make it ordering your academic hood easy! 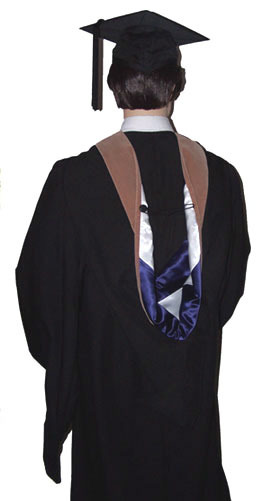 Academic hoods are worn over the graduation gown to signify the degree obtained and the university of institution where the degree was awarded. The degree is signified by the color of the velvet on the hood, which is seen on both the front and the back of the hood. Please note that in the case of the PhD degree, the rich royal blue color is used, to represent the PhD, rather than the discipline color or field of study. What that means is that unlike an Ed.D., who receives light blue velvet for (education), or a D.Sci who receives gold velvet (for science), or a D.M.A who receives pink velvet (for music), a Ph.D in science, education or music would still receive dark blue velvet. PhD holders wishing to dress up their hoods or doctoral gowns and "show their discipline" may elect to have us add degree color piping on their deluxe doctoral hoods or doctoral gowns. The school colors are shown on the satin lining which can be seen on the back of the hood. Because many universities use different colors to designate each campus, when ordering your academic hood, please be sure to let us know the location (campus) where you graduated, in addition to the name of the school. Caps and Gowns Direct is reachable by phone, fax and e-mail for all your academic regalia requirements. university caps and gowns order form. master's graduation regalia order form. 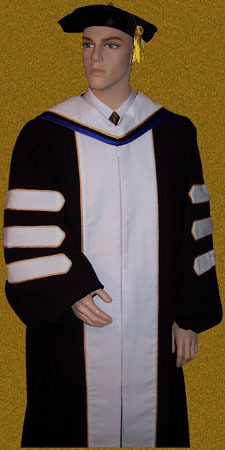 PhD Gown (with gold piping) and academic hood gold piping front view. 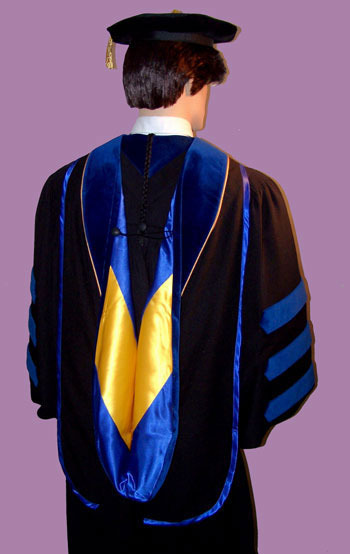 Rear view: deluxe PhD hood (doctoral hood with PhD blue velvet). Lining colors (school colors) royal and gold. Also features gold piping on hood (between PhD blue velvet and black fabric "shell" of hood). 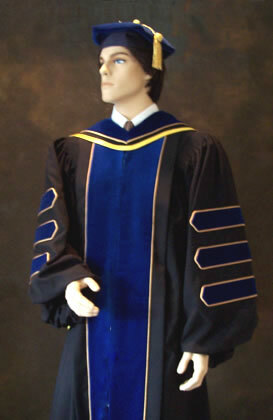 Master's Cap and Gown, with MBA hood front view above. Faculty members: Miss the ordering date in your local bookstore, but still want a quality doctoral gown and hood? 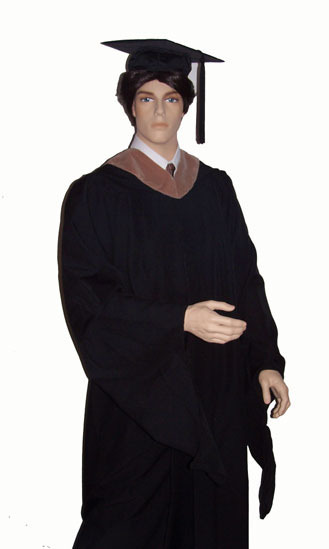 We keep deluxe PhD gowns and doctoral gowns IN STOCK, as well as tams and hoods, and we accept late orders. We also have pleanty of LOANER gowns and HOODS available, in cases when you ordered too late to have your hood made and arrive before you need it. Just let us know when you need to wear your regalia, and we'll rush you a loaner hood with your cap and gown -- at no extra charge! Then when your 'real' hood is arrives, just send us back the loaner.